With almost 1,000 items of all shapes, sizes, and values available – including a 2011 Toyota Prius Hybrid* generously donated by your New England Toyota Dealer – the televised Rhode Island PBS 2011 Spring Auction kicks off in just over a week. Bidding opened online on April 18. "Despite the flagging economy, companies and individuals have responded to the Auction with overwhelming support and generous donations," said WSBE Auction Director Jeffrey Hartley. Looking around the storage room, he remarked, "There literally is something for everyone, and in every price range." Hartley has been the WSBE auction director for almost 10 years. In that time, he has seen technology undergo a huge revolution, and he has kept pace by moving all auction activity onto the Internet. "Every Spring Auction item is posted online," Hartley said. "This is our third year of putting all items online. People really love the convenience. Everything from a $10 pizza to the $25,000 Prius is available for preview and bidding online." In addition to browsing pictures and descriptions, online bidders will know the exact time each item will be sold, to help them devise their bidding strategy. During the televised auction, bidding activity can be tracked in real time. The auction site also permits proxy bidding, which means bidders can reserve a maximum amount they are willing to bid on an item. It's important to note that only the minimum dollar amount needed to win the item will be used. Although not foolproof, the proxy bidding strategy is especially useful if a bidder will not be available to watch the auction close on an item of particular interest, or if the bidder suspects there will be increased competitive bidding at the last minute. "A bid can sit unchallenged for days or even weeks, but there are watchers who are keeping an eye on it," Hartley noted. "Then, in the final minute, bids come in from all over, and the person who had the winning bid two minutes ago loses out. That happens several times every year. Proxy bidding can help protect against that by automatically challenging counter bids. It's what makes auctions so exciting." Fans of the popular annual event who do not have Internet access can still watch the auction live on television and call in to place their bids from Wednesday, May 4 through Saturday, May 7, beginning at 7 p.m. each evening. "All bids will be placed online, whether bidders do it themselves on computers at home, or by calling our studio and having our volunteers place bids online for them," Hartley explained. Conducting the auction online opens it up to a world-wide audience. "We have had auction winners from all over the country, even as far away as California and Washington," Hartley said. Casting a wider net using the 'Net increases visibility and positive exposure for the station, and for the many businesses that donated goods and services. Still, it is the close connection to the local community that differentiates WSBE from other public television stations in the region. "The heart and soul of WSBE is our relationship with our members, donors, and volunteers," Hartley stated. "There is no greater proof of that than our Spring Auction." To see auction items, bid online, or for more information, visit www.ripbs.org. Upstairs Downstairs is an updated version of one of the most-loved television series. Jean Marsh reprises her Emmy-winning role as Rose Buck, along with series co-creator Eileen Atkins (Cranford). 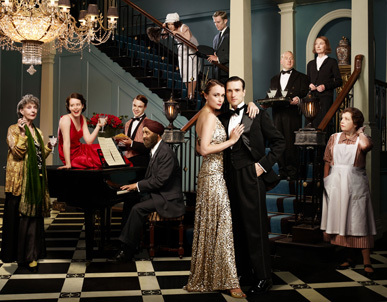 Keeley Hawes, Ed Stoppard, and Art Malik (The Jewel in the Crown) also star. This video gives a humorous and dramatic background about the three-part series. When the master of 165 Eaton Place, Sir Hallam Holland, carries his wife across the threshold of their new home, Lady Agnes exclaims with pleasure, "What a ghastly old mausoleum!" Neglect has strewn cobwebs everywhere and furred the surfaces with dust. But with a sumptuous renovation and the help of the indomitable housekeeper Rose Buck (Jean Marsh), the iconic address so beloved in the original series Upstairs Downstairs is soon restored to its former glory. It's 1936, a tumultuous time in Britain, and within the walls of 165 Eaton Place, characters from an orphanage, a damp Welsh castle, the heart of the British Raj and elsewhere together will face a changing world, not just upstairs and downstairs, but side by side. Written by Heidi Thomas (Cranford, Madame Bovary), Upstairs Downstairs stars co-creators of the original series Jean Marsh and Eileen Atkins (Cranford, Bertie and Elizabeth). Also starring are Ed Stoppard (Any Human Heart), Keeley Hawes (Wives and Daughters), and Claire Foy (Little Dorrit). New Ingredients and Moving Parts Define "A Lively Experiment"
Beginning in May, A Lively Experiment – democracy with a Rhode Island accent – will undergo the biggest changes in the show's 24-year history. A Lively Experiment will feature a new moderator, Dyana Koelsch. Dyana is a former award-winning political and investigative journalist for NBC 10, and the former RI Assistant State Court Administrator for the Rhode Island Judiciary. Ms. Koelsch owns DK Communications, a PR and strategic communications firm in Cranston, RI. Framing the new host, new day, and new time will be a new look and a new set. The sharply curved horseshoe desk will be reshaped to permit more face-to-face discussion. Murals of Rhode Island landscapes against a photogenic blue field will provide the backdrop for more dynamic camera work. The opening sequence and music will also be new, and the format may also incorporate short taped segments or news footage to establish an issue's context. "We're very excited about these improvements," said WSBE President and CEO David W. Piccerelli. "We're especially pleased to welcome Dyana to the program. Her experience as a journalist and a legislative strategist bring the right balance of objectivity, insight, and incisive inquiry." Ms. Koelsch said she was honored to be hosting A Lively Experiment. "As a long time viewer, I know the show has a proud history of informing and creating uncensored dialogue around the important issues impacting our state – something that is critically important given today's economic and political climate. I look forward to participating in this next phase of this 'lively experiment.'" Ms. Koelsch is only the third permanent moderator in the show's 24 years, and the first woman. Former radio broadcaster Steve Kass moderated the show from 1987 until 2005, when he accepted a position in the Carcieri administration. James Hagan, former president of the Greater Providence Chamber of Commerce, has moderated the show since 2006. With all of these changes, one thing will remain the same: fast-paced analysis of the week's political events by news makers and opinion leaders. A Lively Experiment will continue to ignite spirited debate, opinion, and commentary about Rhode Islanders' favorite local pastime: politics and government. Representing independent and partisan viewpoints, a revolving panel of television, radio, print, and online journalists, political scientists, pundits, economists, elected and appointed officials, and other Rhode Island personalities will examine local and state issues. Another staple: the popular “Outrage of the Week.” Typifying the essence of the show’s political commentary, this segment features an eclectic collection of each guest's single most significant issue, often under-reported failings and foibles of Rhode Island officials. Rhode Island PBS Spring Auction - just around the corner! Have you watched the Rhode Island PBS Spring Auction Preview Show yet? If not, here is the rest of the schedule, in the final days leading up to the televised auction on Wednesday through Saturday, May 4 - 7, starting at 7 PM nightly. All items will only be sold by bidding online at the Rhode Island PBS Spring Auction Web site, including the 2011 Toyota Prius, courtesy of your New England Toyota Dealer! You can inform viewers without computer or Internet access that they can call in during the televised auction, and volunteers will happily record and enter the bids. Of course, there's also something exciting about watching the fun and organized chaos that takes place during a live televised event, so join us even with your laptop at your side. Online bidding started Monday and continues until the final virtual gavel falls on Saturday night. Considering the shocking prices at the gas pumps, this is a timely and appealing offer. We are proud, delighted, and ever so grateful to present this show-topper in the Rhode Island PBS Spring Auction - check it out! Your New England Toyota Dealer has generously donated the car people think of when they think of hybrid cars, the Toyota Prius. The much-acclaimed Toyota Prius Hybrid has won numerous green car awards and it’s really no wonder, with its EPA-estimated 50-mpg combined rating. It accomplishes this while delivering amazing performance and producing 70% fewer smog-forming emissions than the average new vehicle. But the 2011 Toyota Prius doesn’t just help save the planet, it will also save you money: Prius boasts very low ownership costs and for nine years in a row IntelliChoice.com has ranked it a “Best Overall Value of the Year.” IntelliChoice research shows that owning a 2011 Toyota Prius could save you over $5,600 in five-year ownership costs. For even more information about this 2011 Toyota Prius, and to preview our other auction items (more lots still being added!) please visit the Rhode Island PBS Spring Auction site. Preview is open, and bidding begins on MONDAY (April 18). Saturday nights, WSBE is the neighborly place to be, thanks to Rhode Island Stories – a collection of independent films with a uniquely "Rhode Island" flavor. For an hour (beginning at 7 p.m.), visit with neighbors - local people, places, and events that punctuate our history and reflect contemporary issues. Some subjects will be familiar; others will be more obscure. Either way, you can count on gaining deeper insight and new perspective you had not considered. The films chosen for Rhode Island Stories have a strong local connection: the documentaries are made by Rhode Islanders, or feature Rhode Island in some significant way. The current collection includes a mix of new and previously broadcast programs, and may be a single hour-long documentary or two 30-minute films. Rhode Island Stories airs Saturdays at 7 p.m., with re-broadcast on Sundays at 11 p.m., on WSBE Rhode Island PBS, digital 36.1, Cox/Verizon/Full channel 08 (Comcast cable subscribers should check local listings for correct channel number), DirecTV 36, and Dish 7776. April 18 – Lizbeth: A Victorian Nightmare – The documentary film explores the legend and lore of Lizzie Borden, the woman accused - and acquitted - of killing her father and stepmother with an ax. The documentary looks at not only the facts of the murder, but at the "popularity" of the crime and the culture of those who follow it. The film started as a master's thesis project by the director, Bristol Community College film instructor, Ricardo Rebelo. He said people are drawn to Lizzie for different reasons, even almost 120 years later. For some, it's the Victorian-era that draws them; for others, it's the fact that an upper-class woman is embroiled in the murder controversy. For still others, they like a good spooky story, or true crime element. No matter what the draw may be, the crime – and the woman at its center – remains one of the most studied in American history. April 23 – Free Wheelin' with Susan Boyce (7 p.m.) – In this breezy half hour, Rhode Island performer Susan Boyce sets off in her Vintage Airstream to explore the warm winters of Florida. Greatest Salesman in Rhode Island (7:30 p.m.) - From the lost manuscript of Rhode Island's Pulitzer Prize winning author Edwin O'Connor (The Last Hurrah), comes a short story about the power of motivation. Six-time New England Emmy® Award-winning director Robert Rose produced the film in the style of a 1950s TV comedy, complete with laugh track and swipe transitions. The Greatest Salesman in Rhode Island is rich in historical and cultural content, and is peppered with humorous local Rhode Island references. The cast features Trinity Repertory Company’s Stephen Thorne; Bob Colonna, winner of the prestigious Pell Award for Excellence in the Arts; and Susan Boyce, national touring performer. April 30 – Home Across Lands - The documentary chronicles the journey of a small group of resettled Kunama refugees as they strive to become self-reliant, invested participants in their new home, Rhode Island. Guiding their transition is the local resettlement agency, International Institute of Rhode Island, which connects them to the resources they need as they work to establish a new community and a better life for their families. Director / producer John Lavall is an Emmy® Award-winning producer and director from Pawtucket, Rhode Island. His work has been broadcast nationally, his films shown in festivals throughout the country. May 14 – Drinking, Driving, Lethal Choices (7 p.m.) – In this half-hour documentary, drinking and driving is explored through powerful stories told by family members, victims and offenders, and those who have survived catastrophic crashes with debilitating brain and spinal cord injuries. This is the second in a drunken driving educational series targeting youth by award-winning producer and director Deborah A. Hoch of Seekonk, Massachusetts. Her first documentary, The Impact of Your Choice: Underage Drinking and Reckless Driving, won a New England Emmy award and was honored with four Bronze Telly Awards for outstanding achievement in Film and Video. Hidden in the Leaves (7:30 p.m.) – The half-hour documentary spotlights the efforts of University of Rhode Island entomology professor and director of the Center for Vector-Borne Disease, Thomas Mather, and his team, to help people understand the risks of tick-transmitted disease. Directed by award-winning filmmaker and URI film media professor, Mary Healey Jamiel, the film explores the serious dangers lurking in an increasing number of rural, suburban, and even semi-urban landscapes in the eastern United States. May 21 – Ilha dos Meus Sonhos (Island of My Dreams) - Ricardo Rebelo, an Azorean immigrant, local filmmaker, and instructor of TV and film courses at Bristol Community College, captures the untold stories of Portuguese emigration to the Fall River area, particularly the two waves of emigration from the Azores in the 1950s and the 70s. The film also explores how Portuguese immigrants have maintained the culture of their homeland here, while the Azorean culture has changed since the revolution. May 28 – D-Day: The Price of Freedom - This film captures the moving stories and memories of five Rhode Island veterans who return to Normandy 60 years after the invasion. Throughout the documentary, former paratroopers, gunners, landing craft operators and others representing the U.S. Army and U.S. Navy share their harrowing tales of survival. This film was written, directed, and filmed by Tim Gray and Jim Karpeichik. WSBE is excited to share the news from the producers of This Old House: for the first time in the show's history, This Old House is coming to Rhode Island! The full announcement follows. For this unique Rhode Island opportunity, WSBE is planning a few special “behind the scenes” activities for our viewers. Stay tuned for details. This Old House airs on WSBE Rhode Island PBS on Saturdays at 4:30 p.m. (digital 36.1, Cox/Verizon/Full Channel 08, DirecTV 36, and Dish 7776; Comcast subscribers should check local listings for the channel number), and on WSBE Learn on Mondays at 9 p.m. and 4 a.m., Tuesdays at 1 a.m., and Saturdays at 7 a.m. (digital 36.2, Cox 808, Cox 808, Verizon 478, Full Channel 109, and Comcast 294). For the first-time ever, the Emmy® Award-winning PBS television series This Old House is looking for a historic home to renovate in Rhode Island. The TV crew is hoping to find a dynamic family with a classic old house in need of help, with plenty of things to save and update. However, the project’s scope must be “just right” – not a whole house, but more than just a kitchen. The renovation must be able to be completed in approximately six to seven months, with construction potentially beginning as early as June 2011 and finishing by December 2011. The ideal project should already be underway with architectural plans and/or have the ability to be “fast-tracked” to the building phase. The selected project will be featured on multiple This Old House episodes airing on PBS in early 2012. The deadline for submissions is May 15, 2011. Please note that the renovations are completely funded by the homeowners and not by This Old House, though the show coordinates product discounts and donations where possible. All donated items are considered gifts, on which the homeowners pay taxes. Please e-mail proposals to pickmyhouse@thisoldhouse.com or submit them via regular mail to: This Old House Project Proposals, P.O. Box 130, Concord, Massachusetts 01742. Select homeowners will be contacted by show producers for further interviews. Due to the volume of proposals received, This Old House will not be able to respond personally to everyone or return submitted materials. 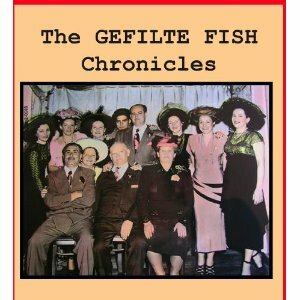 The Gefilte Fish Chronicles returns to WSBE Rhode Island PBS on Wednesday, April 13, 2011 at 8 p.m., with rebroadcasts on Friday, April 15 at 12:30 a.m.; Sunday, April 17 at 10 p.m.; and Tuesday, April 19 at 2:30 a.m.
WSBE Rhode Island PBS transmits over the air on digital channel 36.1; on subscription television, it's Cox /Verizon /Full Channel 08 (Massachusetts cable subscribers should check local cable listings), Dish 7776, and DirecTV 36.